A marine painting that Valtat’s agent, Vollard, exhibited on his behalf at the famous Salon d’Automne of 1905 appeared in the periodical L’illustration alongside paintings by Matisse and Derain. Valtat’s marine paintings were vibrant: proto-Fauvist, bold colours fill the canvas. In his book Souvenirs d’un marchand de tableaux, Vollard recounts how he was introduced to Valtat through Renoir, and recalls Renoir’s own memories of their first encounter: ‘I was in Brittany […] when during a walk I observed a young painter working on a study. I was struck by the harmony of colours he was applying on his canvas. It was Valtat’ (quoted in Louis Valtat à l’aube du fauvisme (exhibition catalogue), p. 300, translated from French). This composition was completed 30 years after Valtat and his Nabi comrades were exhibiting their cutting edge pictures in Paris, but looks back to that early period in terms of subject matter and composition. In the early part of the 1900s, Valtat had built himself a house on the shore at Estérel, South France, which constantly brought him face-to-face with the reds of the rocks in that region against the azure blue of the sea. This landscape played a determining role in the development of his palette, which clearly remained throughout his artistic career. It is likely that Valtat had many fond memories of that place, stories from the period include him swapping a painting with Paul Signac (who was staying in St Tropez) for Signac’s car so that Valtat could travel to see Signac in St Tropez more easily, whilst Renoir was a visitor to Valtat and his wife Suzanne’s home in Estérel and painted Suzanne on at least one occasion (Auguste Renoir, Portrait de Suzanne, 1903). 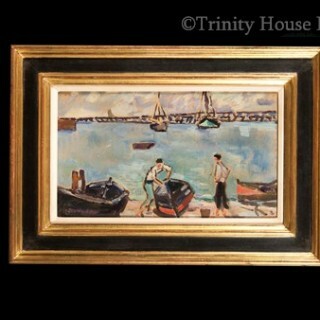 Perhaps this painting, completed in 1934, reflects on that happy period. Compositionally however, this painting can be distinguished from those he produced in the early period of the 20th century and is a demonstration of the development in his painting style. Whereas his early works had delineated colour, here (as with many of his other later works) Valtat punctuates colour with black outlining. This reflects the Modern approach to painting championed by Gauguin – the Cloissonist approach of flat planes, intense colours, and bold circumscribing outlines. 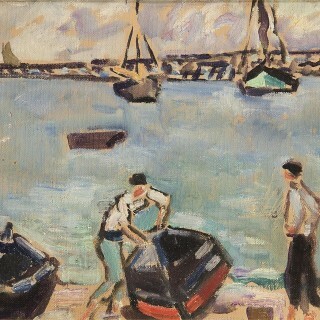 In Le Barques au Port, Valtat uses the colours of blue and red together to evoke the subject to the viewer whilst achieving a balance of composition between the simplistic rendering of the figures and harbour alongside relatively large areas of instinctive brushstrokes of colour to suggest the sky and the sea. The visible brushstrokes in these areas of the composition create a sense of movement and dynamism, whilst the figure tending to his boat in the centre foreground anchors the scene and gives it compositional strength.